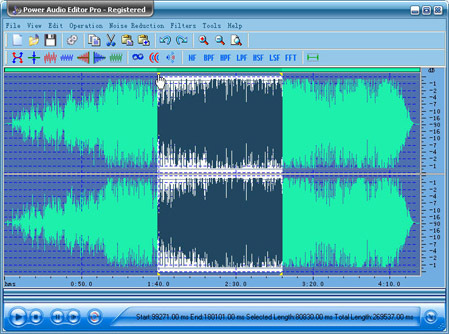 MP3 Audio Sound Editor - filtering, applying various audio effects, format conversion. I really like the interface, its so easy to use. I'm sorta new at making audio media, and this was a big help. I just wanted to make some cassette tapes into CDs (MP3s), and looked for hours for the right recorder. This one, after downloading the demo, was obviously the best choice. And the price is great too. Thanks a ton! You can get 20% discount for Audio Converter,Audio CD Burner and Audio CD Ripper. Power Audio CD Ripper,Power Audio Converter. Now with support for Windows Vista and Windows 7! Power Audio Editor Pro is a visual multifunctional audio files editor which allow you to perform various operations with audio data such as displaying a waveform image of an audio file, filtering, applying various audio effects, format conversion and more. Supports all major audio formats. Apply different filters to the selected part of an audio file (Ban Pass Filter, High Pass Filter, High Shelf Filter, Low Pass Filter, Low Shelf Filter, Notch Filter). Power Audio Editor Pro supports the following file formats so that you can edit audio files? Print multiple photos in one page.You can make photo albums, passport ,mini ID cards,CD covers , contact sheets and 4x6 or 5x7 photos. Add copyright information to your web images,or you can add text to your digital photos. You can rotate different degree for each individual image and batch exporting. Decrypt script software for SQL Server 7 and 2000. Copyright (c) 2004-2010. Ussun. All rights reserved.